WARNING: One of the images in this post is extremely disturbing and will not only gross you out but could possibly traumatize anyone who has not yet dealt with crap like this (pun intended) while caring for a child. And now back to my: Terrible, Horrible, No Good, Very Bad Days. So, it finally happened. Poopapalooza. I wish I didn’t know what that was. Sadly, I know it all too well. The worst part is you think you’re being given this incredible gift of sleeping in a little longer. Suddenly you realize its 8:30AM, you get worried. You rush to the nursery to investigate. You stop in the hall and notice a familiar and horrible stench. 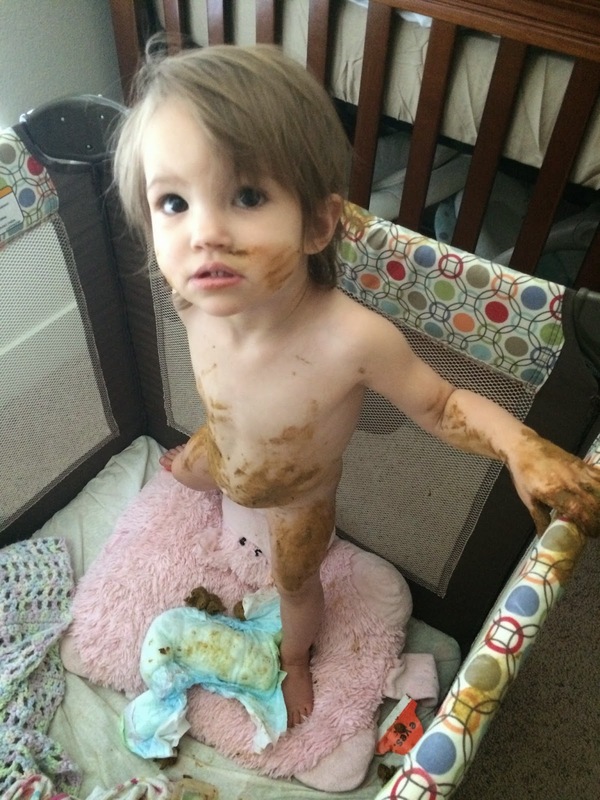 You slowly open the door to find your child happily playing in their own feces. I’m almost 99.9% sure my eyes bulged out of my head and my forehead vein made an appearance. 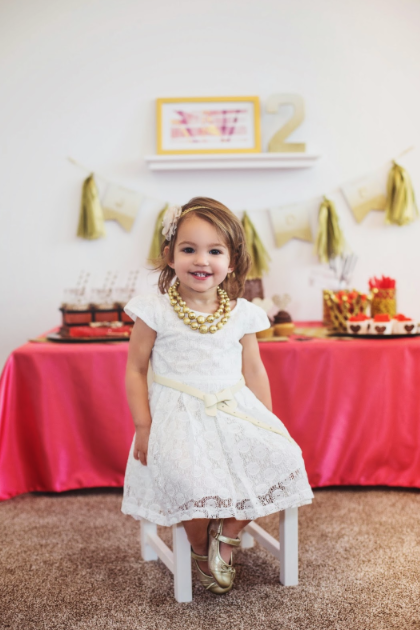 Ever wonder why its called the terrible twos? TA-DA! Being a SAHM (stay at home mom) to a certain two-year-old is 100% the HARDEST job I’ve ever had. In comparison to my last job, managing a hair salon, I thought I would never miss those crazy and sometimes down right awful customers who made your job miserable. Don’t get me wrong, I had an amazing team of stylists and tons of wonderful customers too. But after every bad day at the salon I’d hop in my car, go home and be done. DONE. 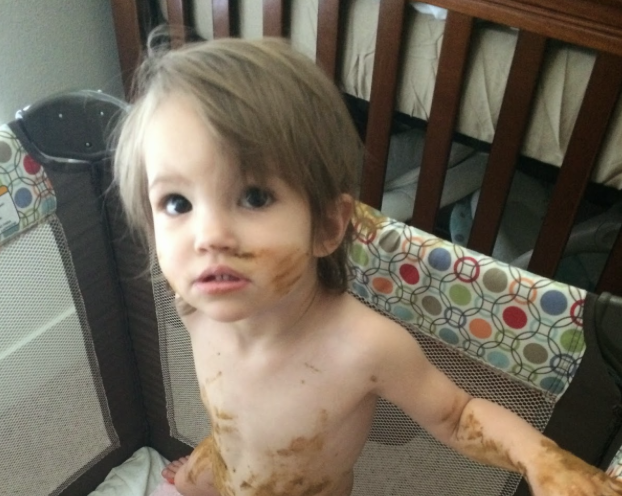 On the days when I wake up to a poopapalooza or similar catastrophe, (Yes, this has happened multiple times. And yes, I now tape every diaper with duct tape thank you very much) those salon days start calling my name. On the other hand, I don’t know that I could have someone else wash poop off of my kid. I’m learning a little more every day, about how not-in-control I am and parents are. Especially with the first kid, there’s no instruction manual. It would be a lot easier if parents COULD control everything our children did. But that would also be extremely predictable and defeat the purpose of parenting. A wise man told me: children are gifts to teach patience to parents, not the other way around. On the bright side, it does wash off. This is the best picture EVER, lol. I love it! I use duct tape for everything these days. If you roll a little piece and stick it to the bottom of something the cute little destroyers in my house can’t break it as easily. Duct really does extend the life of many things when you are a mommy, lol. Great post.